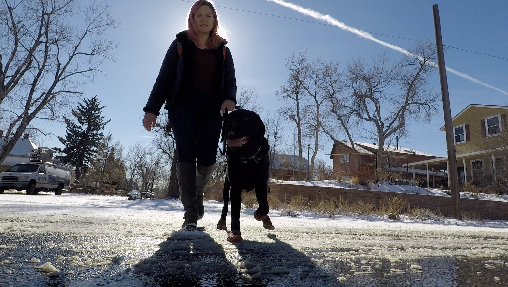 DENVER — A legally blind Denver woman tried to take an Uber to class Thursday morning, but she said when the driver saw her service dog, he refused to let her in. But Uber's response to that is what made her want to share her story. "I have a rare eye condition, and I can't see things unless they are very close to me," said Mollie Baland, who has learned how to adapt with her guide dog Ferris by her side. "He was born at Guide Dogs of America." "The past few days, Ferris (her service dog) and I have had a little trouble with the ice, slipping around, so I was like, 'I'll just order an Uber today and pay the half-mile to go to campus,'" she said. As the driver pulled up, Ferris walked right to the car, but the driver didn't let them in. "The driver rolls his window down, and he says, 'I can't have a dog in here.' And I said, 'Well, technically under Uber's policy you can't deny me because Ferris is my guide dog. If it makes you feel any better, I have a certificate to prove that he is a guide dog.' And the driver did not say anything. He just drove away," said Baland. But a quick search online shows it happens more than you would think. Uber was sued in 2016 after similar stories, and the company settled with the National Federation of the Blind, agreeing to notify drivers they must allow service animals under federal law. The company also agreed to deactivate drivers who knowingly don't allow service dogs. But screenshots from Baland's phone show that when she complained to Uber, the company replied that they would deactivate the driver's account only if they get a second report. "I"m very upset with how Uber handled the situation. The guy was only given a warning," said Baland, who ended up walking to class in the snowstorm. "I am resilient. I just don't want this to happen to other people."